Crowdfunding is an internet-enabled philanthropic process. Crowdfunding aggregates a large number of online donations to allow any individual requiring financial assistance for medical expenses, or a student seeking a scholarship, or any NGO, or an individual to raise funds for any cause. There are no loans or interest to be paid off when it comes to crowdfunding as funds raised online is considered as a donation. For example: 500 donors contributing Rs 5,000 each can mobilise Rs. 25 lakhs for a cancer surgery or organ transplant in less than 24 hours. Crowdfunding is at its nascent stage in India and 4 years ago it was a foreign concept to very many people. Crowdfunding has indeed drastically changed in the way one seeks financial help than what it was before. Thousands are reaping the benefits and seem to be working without an itch. ImpactGuru.com has certainly achieved success in a short span and having been rewarded for one of the most successful medical crowdfunding start-ups. Who are Piyush and Khusboo Jain? 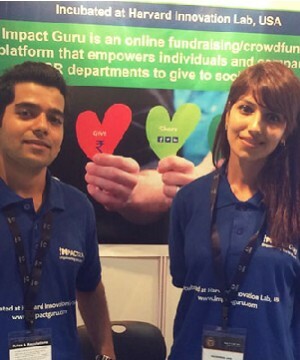 ImpactGuru.com is the brainchild of Piyush and Khusboo Jain. These social entrepreneurs were keen on a business model that would let them add value and meaning to the community. Setting up a crowdfunding platform catered to all their interests and agendas. Piyush’s knowledge of finance and technology was clubbed with the brand and communications skill-sets Khushboo garnered over the years. www.impactguru.com was thus born with a mission to make healthcare accessible to all and save more lives, the platform was incubated at Harvard Innovation Lab in the USA in 2014. Since then, ImpactGuru.com has become the largest crowdfunding platform in India for medical expenses. Over 20,000 patients have benefited by 200,000 donors from ImpactGuru.com. Over Rs 150 crores / US$20mm has been mobilized across 15 countries on the online platform and by its partners. How can ImpactGuru.com benefit you and me? What makes ImpactGuru.com stand out? ImpactGuru.com has a strategic partnership with GlobalGiving.org, the world’s largest nonprofit crowdfunding platform based in US and UK. They are the only crowdfunding platform in the world that can offer Indian, US, and UK tax benefits to Indian and international donors due to an unique technology integration between both their platforms. In May 2018, Apollo Hospitals Group, India’s largest hospital chain invested in ImpactGuru.com and has created a strategic partnership making them the preferred crowdfunding platform for Apollo patients nationwide. In November 2018, Shorooq Investments, Silicon Valley style venture capital firm based in Abu Dhabi and several angel investors from the GCC region joined their Series A Round. It is the only crowdfunding platform to have their own AI-supported storybuilder to help customers write great stories as it’s a major pain point in the industry today. ImpactGuru.com is also the first crowdfunding player in India to launch an Android App for customers. The App presents the user with a quick view of their fundraiser, thus enabling them to keep track of the progress of the campaign, get real-time donation notifications, and post updates. 8-year-old Ahanti diagnosed with dilated cardiomyopathy raised Rs. 26.68 lakhs from 738 donors in a week.